With our new release, we will be changing a few key cards in the game to continue to enhance game balance. 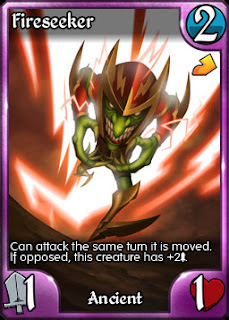 As always, when reducing a card's power level we focus our efforts on making small changes that do not change the core of the card's concept. When boosting a card, we are looking at why the card isn't played and trying to push it slightly into being competitive. There has been a lot of conversation about some of the Legendary cards that we have released over the past year, that they are too powerful, and too far above the power level of Legendaries established in the early days of the game. We've been watching the use of these cards closely and have decided to make some small changes. Elara was created for one reason - to gain life and to be very hard to kill. This has not changed. It is the core of who she is. By toning down her attack we retain this, but give opponents a little more time to deal with her or win the game before she can. T'rror is just that - a terror that can clear the board and must be dealt with quickly or overrun the battlefield. The issue is that by adding the damage reduction, we made T'rror a little too difficult to get rid of. Again, T'rror core concept - destroying the board and creating a tide of demons - has not been changed. 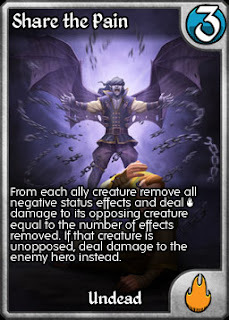 T'rror will remain a top Legend choice in both Limited and Standard. While players have called for all sorts of changes to this card, from limited which abilities it can get, to put caps on how big the creature can get, none of these suggestions really dealt with the core issue: 7 mana for a Legendary 6/6 creature with 6 random abilities is probably fine, but 7 Mana for a Legendary 20/20 creature with 20 random abilities is definitely not. What we knew we had to do is scale the mana with the card. Now you can still unleash a 20/20 "Chuck Norris", but only if you've been able to hold the game and gain 23 extra mana while doing so. You now have to plan your mana carefully to be able to play the card. By doing this the card has a clear position - as part of a mana-generation combo deck (which has clear counters), or as a counter to stall decks where you're often forced to sit gathering mana instead of interacting with the board. Since Olfaan was given a boost last year he has rules both the Limited and Standard arenas, with top usage and a very solid win ratio. 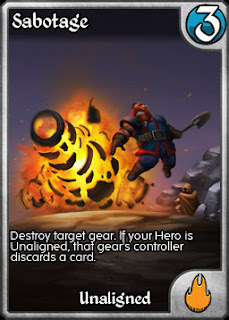 While slowing down Deploy Cannon has had a great balancing effect - there are now 7 heroes seeing significant play instead of 2 - we felt that Olfaan was a little too high up. We decided not to touch Loot Corpse - arguably his best ability - and moved back his ultimate 1 charge. 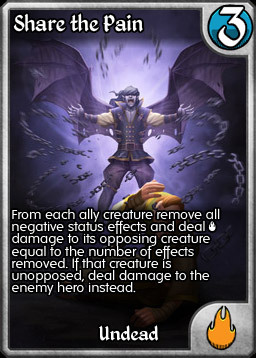 This takes it more in line with Arcanos' ultimate that has a similar AOE damage effect (but that doesn't hit face). Nourish was originally costed at 2, but in Beta there were concerns about a spell that granted 3 Health for just 2 mana. Having been through the days of Ancient's Will and Divine Ascension ruling the meta, this concern seemed valid. Time has shown us that those concerns were unfounded, and it's time to get Nourish back to its original cost. New Promos - Available Now! 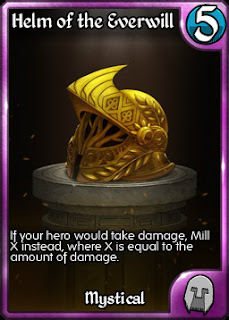 For this Arena season we've done something new - we're releasing a competitive level card as the prize AND releasing it to everyone (who has completed a minimum of 100 battles) for purchase. Let that sink in for a little while. In testing we were able to make a number of decks that made great use of the Helm, even at the cost of 5. 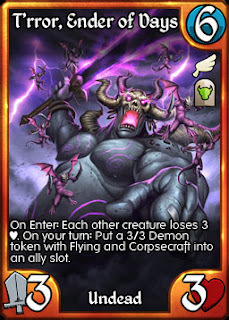 We expect this card to create all new archetypes, and will definitely be worth battling for. Can't place in the top ranks of the Arena? No worries, you can find in the card in the "Rewards" section of the shop. With these changes and the release of the all-new Meta Pack, we're in for some exciting times in Euna! Back in January we teased the release of a new mini-set and we are finally ready to reveal all of the new cards! We are calling these seven cards "The Meta Pack" as they have been specifically designed to help out the Kingdoms in competitive play. 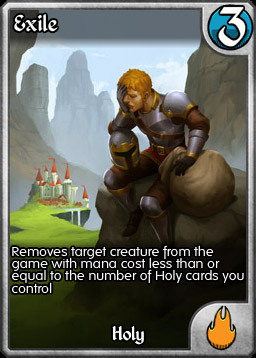 Regulars of the official forums may recognize this card as I discussed it as a way to give the Holy Kingdom a unique spin on a direct damage spell, of which it is sorely lacking. Here we have a potential 1-mana targeted Lightning Bolt, and as it does physical damage, it laughs at Resist. Of course you do need to work for it. 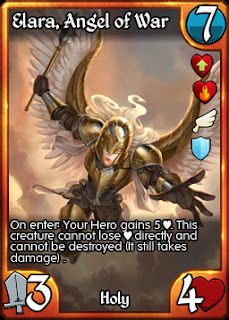 To get the most out of the card you'll need to have a full board - either riding the great Holy weenies, or a mass token generator like Exalted Enforcements or Queen of Dragons, or even the under-rated Sound the Alarm. 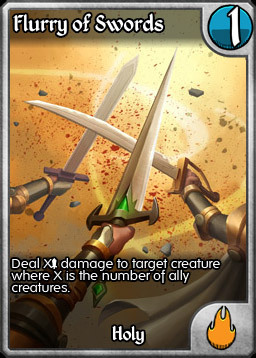 Will Flurry of Swords be the card that gives Devroth and Belnir the opportunity to shine? Time will tell. That is a big block of text, but let it sink in for a moment. This is negative status removal for Undead with a big upside. Tired of being Pacified? Sick of stacking Immolate? Release your anger and throw those effects back at your opponent. With the amount of negative status effects swirling around these days - Poison in Alchemy decks, Pacify in Stall decks, Weakness in Wilirus and Immolate in aggressive strategies - Share the Pain has the potential to be main deck worthy and is definitely worth slots in the sideboard. By decree I declare that your elves will not have Haste, your zombies will not have Reassemble, and that New God you just summoned will arrive naked. Titan Arbiter does something truly new in Kingdoms, it shuts down abilities on a global scale. 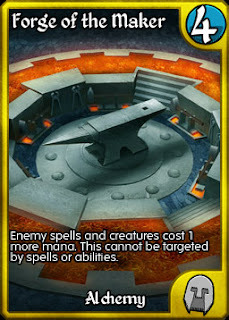 Previously we've only had the unplayed Rune Word "Mundane" to help us against the many abilities in the game, but even that card didn't also prevent existing creatures from gaining abilities. Titan Arbiter works great alongside Skullcrusher Giant and Ancient Priestess - cards with powerful effects but no abilities. 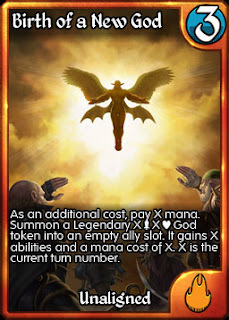 I'm also sure that Truesworn Titan won't even mind losing Splash if it means Fae Paragon arrives with no flight and Mindshocker becomes an exceptionally expensive Grizzly Bear. As we all know, two mana creatures and spells and effectively "free". There will never be a turn that you don't have the mana to play them. 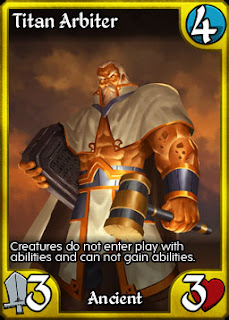 Hence there are numerous decks that run solely on these cheap cards. But what if those small cards cost 3 or 4? That's the potential of Forge of the Maker. And when combined with Elemental's Mana Denial cards, Forge opens up the opportunity for a true "prison" deck that oppresses opponents while you move forward with your own plans. Oh yes. Why destroy gear when you can just take it? 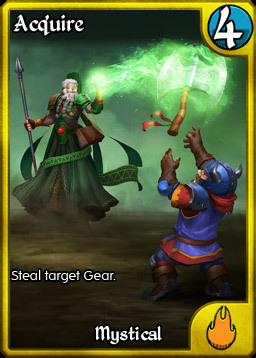 Acquire is gear removal with a particularly Mystical flavour. Inverted Hourglass? Thanks I'll take that. Lava Blade? Sounds like fun. Even a simple Mechana War Banner - better I have it than you, and I'll take the free War Drums effect. In many ways it's a surprise that this card took this long to make, and we expect that it will have an immediate impact. Finally, we have a key card for the 2K era - targeted gear removal for everyone. Sabotage is not a subtle card, but it does what it needs to do effectively. Sabotage also has been designed as the spiritual completion of the Charm cycle from Ascend and Descent, granting Unaligned heroes with a bonus ability of their own. And there you have it, seven powerful cards that will change the game forever. The Meta Pack will be releasing very soon, and for the low cost of just $10 USD (100 Kreds) will include *TWO* copies of each of these seven cards. That's 14 cards - over 350 Gems worth at standard promo prices. The Meta Pack will be available until the end of April, when the cards will be moved to singles section and sold separately for gems. And that's not all we have in store for our next release. Tune in tomorrow to get all of the details. NOTE: Due to the delay in preparing this release, this Arena's season will be awarding older promo cards that newer players may have missed. We will be announcing the new promos in tomorrow's post.